Congratulations on your decision to buy a Havasu home. You’ve saved up money for your down payment and closing costs. You improved your credit score so that you can take advantage of great interest rates. Don’t let the buying process intimidate you. Even seasoned buyers make blunders. Utilize these tips for the first-time Havasu home buyer to help make your transaction run as smoothly as possible. One of the first things you’ll want to take care of as a first-time Havasu home buyer is your financing. Shop around for a lender you like. Don’t settle for the first one you talk to. Ask for recommendations from friends, family, co-workers, and your Lake Havasu REALTOR@. Then, get pre-approved for a mortgage loan. This process may take a little while. The bank needs to double-check your work history, run a credit check, verify available funds for your down payment, and establish that you’re a good credit risk among other tasks. Many real estate agents require you to have an approval letter in hand when it comes time to present an offer. This not only strengthens your offer but it also shows the seller how serious you are about purchasing their house. I can’t stress this enough. Always get a home inspection, even if it’s new construction or a newly renovated property. You don’t know what problems lurk within those walls. An inspector might find issues that your untrained eye doesn’t see. Sometimes, these issues are small and easily taken care of. However, some problems may be too big to overlook. That’s when you re-negotiate your offer to include a discount to cover the costs of the repairs, request that the owner repair the issues before the final sale, or you walk away from the deal altogether. Discuss these options with your REALTOR@ before making a final decision. Buying a home always includes tons of paperwork. Each phase of the home buying process comes with its own deadlines. As a first-time Havasu home buyer, don’t be scared. Your Lake Havasu REALTOR@ should be keeping you abreast of what they need and when they need it done by. Your job is to make sure you don’t miss a deadline. For example, if you have any contingencies, you want to be aware of when they expire. If your inspections or appraisals look like they might run past that time, you’ll need to file an extension. Also, make sure your earnest money deposit is made on time or your offer may become null and void. 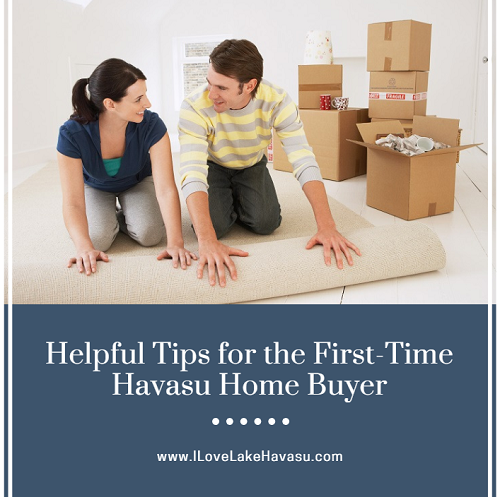 One of the hardest things for any first-time Havasu home buyer to do is to be patient. The real estate process takes time. Sometimes, it may be several weeks or months before you find the perfect house. But, it will happen. Just be patient and listen to your REALTOR@. I promise. At some point, you’ll definitely become a happy Havasu homeowner.